Tue., 5 Nov. - Fri., 8 Nov. Sun., 22 Sep. - Wed., 25 Sep. Sat., 7 Sep. - Mon., 16 Sep. Tue., 25 Jun. - Tue., 9 Jul. Sun., 6 Oct. - Thu., 10 Oct. Tue., 6 Aug. - Tue., 20 Aug. Sun., 1 Dec. - Wed., 4 Dec. Sun., 1 Sep. - Wed., 4 Sep.
See all 412 properties in Salt Lake City Intl. 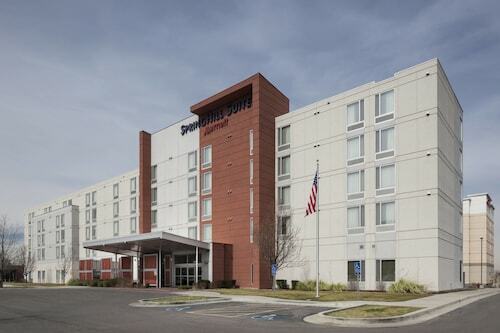 Connected to the airport by free hotel shuttle, Hyatt Place Salt Lake City Airport is also well placed for downtown Salt Lake City, 7 miles (11.3 km) away. Access to highway I-80 is a 4- minute drive. Farther afield, the University of Utah is a 15-minute drive. The Airport Inn Hotel is located about 3 miles from both Salt Lake International Airport (SLC) and the Downtown Salt Lake City area. 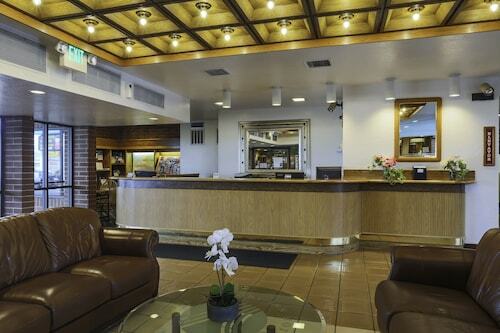 Situated near the airport, this hotel is 1.9 mi (3 km) from Wingpointe Golf Course and within 6 mi (10 km) of Stonebridge Golf Club and Utah State Fairpark. Salt Palace and Temple Square are also within 9 mi (15 km). Situated near the airport, this motel is 2.9 mi (4.7 km) from Wingpointe Golf Course and within 9 mi (15 km) of Salt Palace and Temple Square. Vivint Smart Home Arena and Capitol Theater are also within 9 mi (15 km). 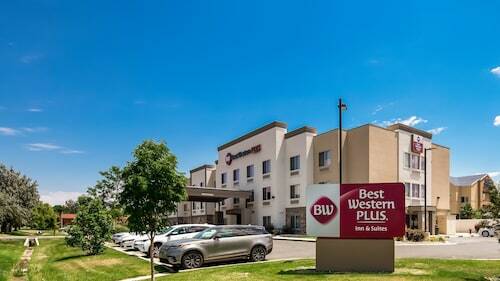 Situated near the airport, this hotel is 2.5 mi (4 km) from Wingpointe Golf Course and within 9 mi (15 km) of Discovery Gateway Children's Museum and Gateway Mall. The Gateway and Vivint Smart Home Arena are also within 9 mi (15 km). Situated near the airport, this hotel is 2.9 mi (4.7 km) from Wingpointe Golf Course and within 9 mi (15 km) of Salt Palace and Temple Square. Vivint Smart Home Arena and Capitol Theater are also within 9 mi (15 km). Situated near the airport, this hotel is 2.2 mi (3.6 km) from Wingpointe Golf Course and within 6 mi (10 km) of Stonebridge Golf Club and Utah State Fairpark. Salt Palace and Temple Square are also within 9 mi (15 km). Situated near the airport, this hotel is 2.3 mi (3.7 km) from Wingpointe Golf Course and within 6 mi (10 km) of Stonebridge Golf Club and Utah State Fairpark. Salt Palace and Temple Square are also within 9 mi (15 km). Question : What is the cheapest date to fly to Salt Lake City? Answer : As of Apr 15th, the cheapest day to fly from Halifax to Salt Lake City is May 10th. Tickets are presently $437, 25% less than the average price for this route. Question : How much is a plane ticket to Salt Lake City (SLC) from Halifax (YHZ)? Answer : Prices can vary from $433 to $984. Booking far in advance can usually help you get the cheapest rate. Prices are usually cheaper the further out you book. Answer : The cheapest day to fly from Halifax to Salt Lake City is on Wednesday. So, if you are trying to save a little cash on your next trip look for flights on Wednesday. Question : How long do most people stay on their visit to Salt Lake City on average? Answer : Of course, you are not most people, but if you were, you'd stay roughly 10 days. Answer : Yes, you can switch your departure or arrival date. If you wish to save some funds in doing so, the cheapest day to fly in April is Wednesday. Flexibility is key when booking travel to help keep costs down. Question : What is the cheapest airline flying from Halifax to Salt Lake City? Answer : WestJet is your best friend for finding that coveted low fare. They offer fares as low as $433, while rates for other flights are as high as $984.